NEW YORK (CelebrityAccess MediaWire) — Sir Elton John and Music Rising will receive the Legend of Live and Humanitarian Awards, respectively, at the 3rd annual Billboard Touring Awards on November 9 at the Roosevelt Hotel in New York City. Awards will also be given to a wide variety of tours, venues and touring professionals, based on data reported to Billboard Boxscore. It is the concluding event at the Billboard Touring Conference November 8-9. John is being recognized for his career achievements, which spans four decades, and is the first artist to be honored with the Legend of Live Award. 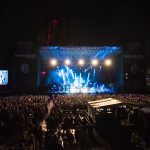 This award is given to concert business professionals who have made a significant and lasting impact on the touring industry and has previously been received by Rolling Stones producer Michael Cohl (2004) and Cellar Door Concerts founder Jack Boyle (2005. John began touring in the U.S. in 1970, and since that time has gained a reputation for being one of the most consistent and critically acclaimed live performers in the business. In the last 15 years alone, John has notched nearly $600 million in grosses and 10 million in attendance from more than 600 public performances reported to Billboard Boxscore. "I don’t believe I have ever seen another artist as happy and passionate on stage as he is," says Elton John’s manager Merck Mercuriadis. "Last year, when he was doing the ‘Captain Fantastic’ concerts, he was playing almost four hours a night and he was just as excited—and singing and playing even better—at the end of each concert as he was at the beginning." Music Rising is a musical instrument replacement fund founded by U2’s The Edge, producer Bob Ezrin and Gibson Guitar chairman Henry Juszkiewicz, with MusiCares and the Guitar Center Foundation. Some 60 artists worked with Ticketmaster, Live Nation, House of Blues, AEG Live and Nederlander Concerts on the fund-raising program that specifically targets Gulf Coast musicians who lost equipment in Hurricanes Katrina and Rita. Music Rising will receive the Humanitarian Award, an honor that acknowledges philanthropic efforts within the music industry and was received in 2005 by the Dave Matthews Band. "We are honored to be the recipient of such a prestigious award presented by Billboard," says Juszkiewicz. "When we launched Music Rising in November of 2005, our intention was to help as many musicians affected by the Hurricane disasters as we could."